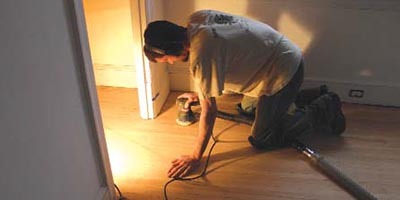 Your room should be prepared before we arrive by removing all furniture. 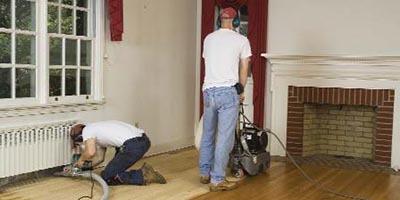 We will sand the floor using a drum sander (right) and an under-radiator machine (left) if there are baseboards or radiators, or toe kicks to sand around. The drum sander runs on 220 electric. 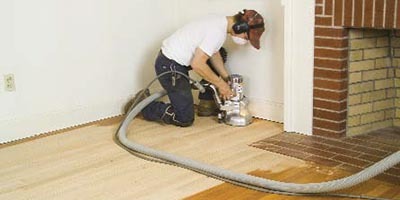 We use an edger to sand areas the drum sander cannot reach. The machines are hooked by hoses to the dust system that sits outside. 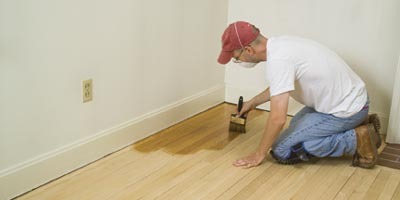 You may need to do touch-up painting around the very bottom of the baseboards if new shoe molding is not being installed. After the floor has been rough sanded and medium sanded, we final sand using the square buffer machine to get out any sander marks left in the floor. Finally, we palm sand around the edges and tight spots that the larger machines can't reach. Corners are scraped by hand. After cleaning the area well, the first coat is applied to the floor. This can be a stain or a clear coat, depending on your preference. 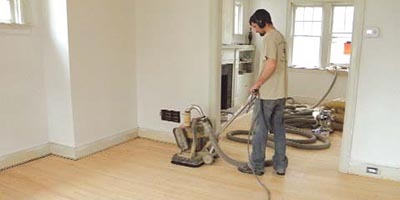 Clear coats require 3 coats total (one each day) and stained floors also get 3 clear coats (4 coats total, one each day). We can supply you with pricing both ways. The floor needs to set a minimum of 48 hours before moving furniture back onto it. Wait a week for large area rugs. See care instructions for maintenance.